The much-loved Simbu has already carved a niche for himself as an actor courtesy his memorable performances in films such ‘Vinnaithaandi Varuvaayaa’ and ‘Achcham Yenbadhu Madamaiyada’ to name a few. Now, he is all set to add a new dimension to his career. As it so happens, he has composed the soundtrack of actor Santhanam’s ‘Sakka Podu Podu Raja’. And, the album will be launched on December 6 in Chennai. Now, it seems that the buzz surrounding the music launch is set to reach a shot in the arm. In an exciting development, actor Dhanush has agreed to grace the event and add more star power to it. 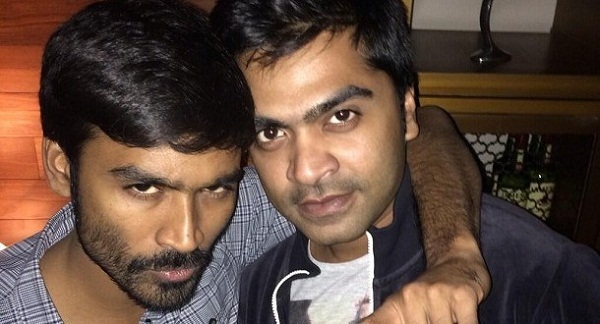 Interestingly, D and STR have always been perceived to be professional rivals. As such, seeing them together is a nice prospect indeed!. In case you did not know, ‘Sakka Podu Podu Raja’ is a comedy and has been produced by VTV Ganesh. In it, Santhanam will be seen alongside Viveik and Marathi actress Vaibhavi Shandilya. The film will hit screens on December 22 alongside Sivakarthikeyan starrer ‘Velaikkaran’ and Salman Khan big release ‘Tiger Zinda Hai’. On a related note, this is a busy time for Dhanush as well as STR. Dhanush will soon be seen in the Hollywood film ‘The Extraordinary Journey of The Fakir’. Besides this, he also has ‘Vada Chennai’ and eagerly-awaited ‘Maari 2’ in his kitty. ‘Vada Chennai’ is a gangster drama while ‘Maari 2’ is a masala entertainer. As far as STR is concerned, he will soon be working with Mani Ratnam.